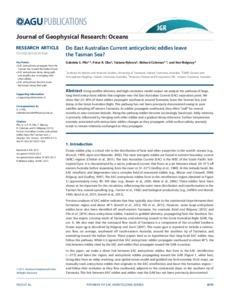 eCite - Do East Australian Current anticyclonic eddies leave the Tasman Sea? Do East Australian Current anticyclonic eddies leave the Tasman Sea? Using satellite altimetry and high-resolution model output we analyze the pathway of large, long-lived anticyclonic eddies that originate near the East Australian Current (EAC) separation point. We show that 25-30% of these eddies propagate southward, around Tasmania, leave the Tasman Sea, and decay in the Great Australian Bight. This pathway has not been previously documented owing to poor satellite sampling off eastern Tasmania. As eddies propagate southward, they often "stall" for several months at near-constant latitude. Along the pathway eddies become increasingly barotropic. Eddy intensity is primarily influenced by merging with other eddies and a gradual decay otherwise. Surface temperature anomaly associated with anticyclonic eddies changes as they propagate, while surface salinity anomaly tends to remain relatively unchanged as they propagate.